If there are other things you are considering in your church such as, remodeling, redecorating, furniture, statues, or a new design for your whole church. I have contacts in all these fields that I will gladly share with you. Religious murals, paintings, symbols, restoration and design. Liturgical murals, paintings, symbols, restoration and design. 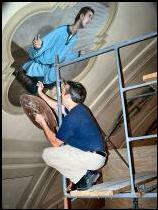 Ecclesiastical murals, paintings, symbols, restoration and design. When asked what my favorite church is … the first one that comes to mind is the church I spent my childhood summers in. It is my grandparent’s church in Easton, Minnesota. The church is nestled in a small town and is what I consider a traditional “Old Catholic Church.” It is beautifully ornate, full of decoration and art. I love that church and the special, uplifting feeling I get whenever I walked through its’ doors. I know it is that church and the feelings attached to it that inspired me to do the work I do now. And, it’s that feeling that I strive for each and every time I get to work on a piece of art for a place of worship. My name is Craig Gallagher. I am an artist living in St. Michael, Minnesota with my wonderful wife and four children. I’ve been a professional artist for 25 years and have served the spiritual community through artwork for the past 20 years. I paint in a realistic style because the images I paint are of real people and real events. I truly love and feel blessed to be able to do the work that I do. I get the best of both worlds; help bring churches back to their previous glory, or add splendor to a new or renovated church. I grew up learning to put other people first, to listen, to make observations, and to always pray for guidance . I know my best paintings are because I’ve done this, and my reputation proves it. I promise to do whatever is in my power to make your project successful. * A dedicated, hardworking, prayerful, spiritual artist with a proven reputation. Thank you for taking the time to visit my website. Please feel free to contact me with any questions.